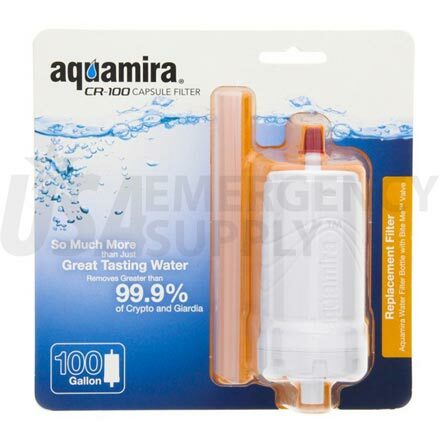 Replacement Filter: Fits the New Aquamira® Water Filter Bottle with the patented Bite Me™ valve. So Much More than Just Great Tasting Water: Aquamira CR Filtration Technology not only removes chlorine, bad tastes and odors, but it also removes over 99.9% of Cryptosporidium and Giardia; the two leading causes of waterborne illnesses. Aquamira CR Grade filters have been tested and proven effective in removing Cyanotoxins such as Microcystin and other biotoxins. Designed for Ease of Use and Peace of Mind: The new 100 gallon capacity Aquamira Filter Capsule boasts several improvements over the previous "Drop-In" filter design. The capsule is light weight, compact, easy to install, and ultrasonically sealed. Venting is independent of the filter, eliminating any chance of cross contamination. Since the filter draws from the bottom of the bottle, there is no need to tip the bottle to drink. High flow, low pressure drop. Economical: One filter = 640, 20oz. plastic water bottles. Improved venting and filter/bite valve interface. Aquamira CR Filtration Technology™: consists of a formulation of activated coconut shell carbon, porous plastic and other propriatory filter aids. The components are molded under controlled heat and pressure in a process known as "sintering". The result is a solid but porous block structure with uniform pore distribution, high flow rates and long filter life. This filter block is then assembled, sonic welded, tested and lot stamped, under tightly controlled conditions in our production facility in Logan, UT. Testing and Certification: All Aquamira CR rated filters are tested in accordance to NSF 42 protocols to reduce chlorine, taste and odor. CR rated filters are also pre-tested in accordance to NSF 53 protocols to remove more than 99.9% of Cryptosporidium and Giardia. Miraguard™ is tested according to EPA/JIS guidelines for antimicrobial performance.